Conduct Does Not Equal Rulebook: Emma F.
While recently reading the book Originals by Adam Grant, I was intrigued by a study that was presented on the topic of raising children. The study evaluated discipline techniques of parents of non-Jewish people who housed Jews during the Holocaust, and the parents of those who did not. What separated these two groups? The study determined that those who were raised to develop their own moral conduct were more likely to be compassionate individuals (the group that housed Jews in danger). These people’s parents were more likely to encourage their children to consider how their actions affected others. The other group, conversely, was more likely to have been raised in a rule based system, which removed the need for the child to think about what they personally considered to be right and wrong; these people were more likely to be a part of the group that did not house Jewish people. Although there are more nuances to this experiment that I presented, I think it speaks to some of the value of ethics as a topic of philosophical discussion. As Dr. Sandell noted in his lectures on Moral Philosophy, the discussion of ethics is supposed to “make the familiar unfamiliar”, to put a microscope to our actions and discover the basis of our moral decision-making. Throughout this unit, I’ve learned that the developing our own morals does not mean creating a set of hard-and-fast rules to follow, but identifying values that will guide us as we unpack difficult situations and make decisions. This is the ‘moral conduct’ mentioned in the experiment above. For me, the value of ethics outside of the classrooms is to promote a sort of independence in our actions. When we stand by the values we deem important, we can put more confidence in our idea of the ‘good’ or ‘moral’ action. When we look to Hollywood and other entertainment industries, the push and pull of good and bad, the hero and the villain, is obvious; however, in a world where our problems are not so clear cut, it is crucial that we think for ourselves, and that our morals are self-generated. On the other hand, ethics in the classroom has been an interesting ride. Like I said before, the idea of ‘good’ and ‘bad’ is instilled at a young age, but I hadn’t really been exposed to the subtleties of the schools of thought that drive moral decision making, the two that we touched on being Utilitarianism and the Categorical Imperative. Like most of my classmates, I can’t marry myself to the values of one or another, but there are some threads within each that I find attractive. A boy has a chocolate bar, sees a homeless man in need and sacrifices his own chocolately desires to give the bar to the homeless man. In another situation, a boy has a chocolate bar and takes a bite, decides he doesn’t like it, then passes it on to the homeless man in need. Assuming that both situations have the same outcome (let’s say the man receives the same amount of chocolate), I would say that the decision of the boy in the first situation holds more moral value. The key part is that the boy makes a sacrifice, and although he thinks that he will enjoy the chocolate bar, he places the homeless man’s needs above his own. The decision is driven by a contemplation of needs and an overall selflessness. The other situation, although not immoral in my eyes, isn’t first prompted by an independent action towards charity, but as a secondary option that was fulfilled when his primary course of action (eating the chocolate bar) wasn’t so pleasant. Of course, there are other conditions to explore in this scenario, such as whether or not the first boy performed his action for the praise of onlookers or as for fuel his own ego, but the principle remains the same. The good will of a person does affect the moral worth of the decision, and in general, if the will of a person is rooted in greed or exploitation, then it cannot be considered a ‘good will’. This would also mean that a a positive result could spring from an absence of good will, and that a negative result could spring from an action of good will, and these are the conditions that this school of thought upholds. Utilitarianism: “Do the thing that makes the most people content” has some problematic strings attached, so for the sake of concision, I’ll stick to the parts that I consider the most personally useful. In the most basic sense, utilitarianism just seems practical; it support the act of letting people vote on a course of action, and implementing the most popular choice. In other ways, there are grey spaces that are made when we ask the questions “Does some people’s contentment matter more than others?” and “Should we consider what is best for a society’s function over the contentment of a group of people”? However, I do believe in the notion that we do often have to make sacrifices for the sake of overall gain. What makes ‘most’ people happy or satisfied isn’t often what makes all people happy or satisfied, and we must accept that we may sometimes be on the sacrificing side so that there can be a net positive reaction. For example, this can manifest in the classroom when a student sacrifices their act of contributing to a discussion so that others may speak, contribute, and diversify the discussion. When organizing an event, an organizing member may volunteer to do a tedious or grueling task that is unpleasant but will ensure the success of the event and the enjoyment of many people. These examples are just simple situations of sacrifice. It is very important to add that this doesn’t apply to situations of human rights. There is a crucial distinction to be made in the statement that certain groups of people should not experience reduced levels of human rights (legal, social, political, etc.) so that other groups should have more power. Although this situation is nuanced in many facets of our international society, I cannot say it is moral. Now it’s time to put these ethical discussions to work. The moral dilemma that I want to examine is this: to trigger warning or not to trigger warning? For those of you new to the term ‘trigger warning’, it is a ‘statement at the start of a piece of writing, video, etc., alerting the reader or viewer to the fact that it contains potentially distressing material (often used to introduce a description of such content)’. I am interested to discuss the place of trigger warnings within the slam poetry community, where there has been a continuous conversation about whether or not artists should use before performing a potentially distressing piece. It is not uncommon to attend a poetry slam and see poets delivering trigger warnings for sexual assault, drug abuse, self-harm, and other topics associated with emotional trauma. The pro-trigger warning side seems obvious at first. If artists can let people know about an upcoming sensitive topic, then those who might find the topic harmful can mentally prepare themselves or remove themselves from the environment. From a utilitarian perspective, we are increasing the amount of net happiness because those who may have experienced unhappiness from the artistic presentation were able to remove themselves completely. From this perspective, trigger warnings seem courteous and fair. However, I do think this situation is a bit more faceted than that. I’ve recently been speaking with several of poets in the community about their thoughts on trigger warnings, and have uncovered a few more layers. Firstly, one of these poets was confident in saying that taking care of your audience is a responsibility of the artist on stage, but that this care doesn’t have to come in the form of a trigger warning; we want art to illicit vivid experiences in our audiences, so audience care (in it’s ideal form) means not preventing these experiences from happening. A crucial process in attending a poetry slam is facing emotions that are difficult to deal with, and ‘interrogating’ those feelings further (my friend noted that if she doesn’t feel uncomfortable at one point in a slam, she considers it a failure). This stand point challenges the utilitarian perspective because it claims that what is most challenging can also the most valuable. Being prompted to examine our feelings of discomfort isn’t often a purely joyful act, but it is still worth doing because it can lead to intrapersonal understanding, for example. However, for these moments of discomfort and contemplation to take place, we do need to be in a mentally sound and lucid state of mind, and for some individuals, a certain topic may inhibit this state. That is the main push and pull of the trigger warning discussion. But where does our moral responsibility exist in this conversation? I do agree that it is our responsibility to take care of the audience- to deliver a thoughtfully crafted poem that resonates with others an delivers a message. If we are using trigger warnings as permission to ourselves to present shockingly graphic and devastating material, we have to consider the value of such a piece. Secondly, in terms of responsibility, we also have to consider that it is impossible to prevent all emotionally harmful reactions from occurring. We simply cannot always be sure of what kinds of things can act as triggers for different people (smells, locations, objects), and although we can try our best to be cognizant of the effect of our words, they have different connotations within different people’s lives. It is also important to point out that the real world doesn’t have trigger warnings- we can encounter triggering things in our day-to-day life, and it is important (to a healthy level) that we keep the slam space from turning into a sanitized space free of discomfort or challenging topics. I believe it is important for audience members to realize that when they enter a slam, they are acknowledging the possibility that they may hear or view things that will make them feel things (those things not always being pleasant), and that the organizers of the slam should also publicly acknowledge this possibility as well (this is commonly done in Vancouver). The slam, as my friend said, is a microcosm of our real world, and we should treat it as such. This means that the community values artistic diversity and experience, but does not tolerate hate speech, for example. The conversation could definitely go on. For me, the trigger warning conversation is very intriguing because it is so closely tied to a community that I am a part of. The conversation also changes and evolves when we speak about trigger warnings on educational material, social media, and other social situations. To tie back to what I said earlier about moral conduct, the discussion of trigger warnings doesn’t have to be one that decides whether or not we ultimately use them. We have to ask ourselves why we might use them, the effects it has on the people around us, and the ways we can change our mode of action to accomplish the same goal. I would love to hear what you have to say about the topic, so please drop a comment! Cyclical is defined as occurring in cycles or recurrent, while Linear means extending along a straight line, and processing from one stage to another. So..what does it mean when we talk about time being cyclical or linear? I mean the clock does go round and not straight. For this project I’m going to break down the big question that a lot or most people have, is TIME LINEAR OR CYCLICAL?
. Like many scientist including Albert Einstein the Big Bang was the beginning of time. Einstein also said “time is relative,” he said that the faster we moved the slower time will pass, and that in our galaxies time vary. Time for a fact is always going forward and never in reverse since it’s a direction, and still to this day the problem is still unsolved in physics. One way to explain why time can’t go backwards is entropy, the definition for entropy is a law that states nothing ever decreases. Therefore if milk is spilled or wood was used make a fire it can never go back to its original states, which means that entropy can go forward or stay the same, but can never decreases. Since time has a beginning (Big Bang) will time ever end? The pros in life said that time will end when another big event or rip like the (BB), but we can’t be to sure about it. The pros said that time was created by the BB but we have philosophers like Aristotle who believed that time didn’t have a beginning, because when or where we start there is always an imagination of the earlier time. Augustine had similar philosophical inquires like Aristotle but believed that the “universe was made with time and not in time”, this kind of touches on the fact that he to believe time was there when the universe was created, and not the other way around. On to the next question where it’s not as easy to answer…what does it mean when time is cyclical? When we watch movies or an episode of a cartoon we often see a forward/fast timed of a sunset and a sunrise, that event is consider a short cyclical pattern. Events like sunset/sunrise allows us to measure time even better we can find out growing seasons when to sleep and when to wake up, most people would consider time as cyclical because of these patterns. But not every culture, country and person believes that time in cyclical its been noted that cyclical time depends on the culture. Places like China, Africa and Native American see time as cyclical rather than linear because they believe time controls their lives, which makes sense, since those countries are more devoted on working when it’s morning and sleeping when its dark. They thought that their lives didn’t control time and that they were to adapt to the harmony of the cyclical time. 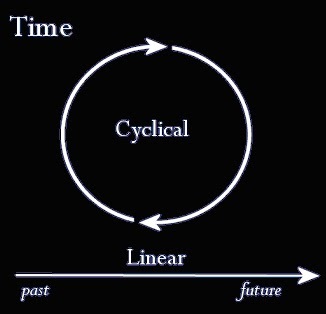 So if cyclical time is describing time being a cycle occurring again does that mean we are just living in a loop? No, we do relive certain events like waking up going to school or work etc but each of those events are different. would be rather hard and confusing because I feel for both, because we don’t live in a cycle everyday but not everyday is the same and it will come to an end one day. PS. i feel like i did this wrong but oh well…. Utilitarianism is the theory that actions should be taken based on their interpreted outcome. If your actions lead to an outcome in which the most happiness and least pain is generated, then the more just your action is. Basically, you’re always acting for the greater good, no matter the actions you take. An example of utilitarianism would be from the trolley problem; choosing to kill one person in order to let 5 live instead. This is taking action for sake of the greater good, even though it means sacrificing one life. Utilitarianism differs from Kant’s theory of the categorical imperative which is based on every individual’s moral compass. The obligation we have to our own morals overpowers our desires and inclinations. An example of categorical imperative would be buying and giving food to a homeless person you see. Having a categorical imperative is also having no ulterior motives for the things you do-you do something for the sole purpose of it to benefit someone else. There are parts of both of these theories that I agree with and try to incorporate into my own morality. In terms of utilitarianism, I feel like I have always tried to be a people pleaser and a problem solver, so the concept of making choices to benefit all parties makes a lot of sense to me. On the other hand, I associate with the categorical imperative as I have a strong sense of justice and am a strong believer in doing things for the right reason. I think it’s important to have a balance between these theories, as there are many good things to take away from them. However, there are cons as well. Because utilitarianism evaluates actions based on their consequences, it can become tricky in certain situations. For example, we discussed in class the scenario of the army(the good guys) holding a person from a terrorist group(the bad guys) hostage and deciding to torture them in order to gain information that would ultimately help them save lives. In order to help the greater good, would you be willing to compromise your morals? As for the categorical imperative, it focusses more on the meaning behind actions rather than the consequences which can also be troublesome in certain situations. A global issue that comes to mind when thinking about moral philosophy, is the controversy around abortion. Approaching this topic as someone who is pro-choice makes all the solutions seem very logical and easy to understand. On one hand, you have the pro-choice argument which is that abortion should be legal and accessible to all women because it’s their body and their choice. On the other hand, there is the pro-life argument which is that abortion should not be legal because it is the murder of a fetus. Looking at this with a utilitarian outlook, the option that has the best consequences is the pro-choice. There are many reasons why women choose to get abortions for ex. not being financially or mentally stable enough to raise a child. If this is the case, if the woman is forced to keep the child, it will most likely create a difficult life for not only the mom but the child as well. If the mother chooses to get an abortion, I believe its because she thinks it’s the best possible option for herself and her child. By forcing women to not have abortions, it creates anxiety and heartache, as well as some women will go through unsafe means to get one. So basically, by this school of thought, the pro-choice option generates the most happiness and therefore abortion should be legal everywhere. This also ties in with the categorical imperative, because choosing an option that is best for the mother and the child is morally right, and its unfair to deny this option. Ethics was one of my favourite units; I loved learning about these theories as well as discussing hypothetical situations around them. I think this stuff is super important to be aware of and understand, because it’s applicable to everyone and everything. Utilitarianism is a system of ethics according to which the rightness or wrongness of an action should be judged by its consequences. The goal of utilitarian ethics is to promote the greatest happiness for the greatest number. Therefore because utilitarianism focuses on the happiness of the majority, which to be fair is most practical, it does not account the happiness of the minority. An example of utilitarianism is if a pharmaceutical company releases a drug with approved side effects, because the drug is able to help more people than are bothered by the minor side effects. This act of utilitarianism showcases the “ends justify the means” mentality. Utilitarianism major fault is that the “little guy” doesn’t get his way, for this reason, I would not consider myself to fully follow the utilitarianism ways. Although I do agree with Mills concept of higher and lower pleasures. The best example I can think of, for a person who just recently found a new love for hiking, is that the view after a day long hike, is much more gratifying than one that you took a gondola/elevator to get to and that the amount of work and time put into something accounts for how much pleasure that thing will give you. Categorical Imperative is an unconditional moral obligation that is binding in all circumstances and is not dependent on a person’s inclination or purpose. While I agree with the idea of doing things for because it is the right thing to do. I find it hard to wrap my head around a deed that is truly in the nature of good will, for I find that it’s easy to find an ulterior motive behind every action. What I interpreted from Kant’s Categorical Imperative, was that if you commit an act that benefits someone, yet one of the reasons you did it was to feel good about yourself, the act itself is not good anymore, and I don’t agree. The example I came across are the countless videos you see on Facebook, Instagram etc. of people doing good deeds, whether its giving food to the homeless or rescuing animals. This issue I have with these videos, is that it’s hard to detect whether the person is doing the deed out of the goodness in their hearts OR because they have a camera filming they want to flex and try to get as many likes and shares as possible. Now while these people may want fame, I still believe that it’s a good deed because in hoping for a viral video, in turn they are still helping someone out and I believe that that is still good. And solve our difficulties earnestly so that when they are gone, we don’t need to use them again to solve them. What it means that if we go about things with Utilitarian intentions our problems should be by logic, unsolvable and infinite. My ethical issue is the armed forces going into schools with goals of easy recruitment. Though wrongfully preaching to the young that dying can be a great thing is not illegal, it is morally wrong. Let’s face it, we always want what we cannot have and young people, my peers, are no exception to the rule. We are not eighteen, we cannot vote and as a result, we cannot enlist. Because of this restriction we as humans make it our magnum opus to break it, naturally. Young people are not allowed to do many a great things and enlisting in the armed forces is one them. But, it is when the government uses the anticipation we all feel to get what they want whether it is power, control or money it is then, morally wrong. But the burning question I know we are all asking is “, wouldn’t be for the better good. I mean sure we shouldn’t enlist our young but it’s to stop ISIS.” Are we all in agreement that ISIS and various other terrorist groups are bad not just by what they do= but who they include in they’re wrong doings. ISIS along with the US military, recruits the young. Similar tactics are used and the cycle of utilitarianism continues. More young people die requiring more young people to die on the opposing side and so on and so forth. I am pro categorical Imperative. If we don’t be our enemies our enemies won’t be us and that’s my moral and ethical stance. Personally, I believe that on a smaller scale, doing things that benefit the majority is the respectful thing to do, (working on a group project in school, choosing food for a party, the railway situation that was given in the harvard justice video, any situation as long as it doesn’t cause anyone serious harm or contribute to social barriers.) However, on a larger scale I think utilitarianism can be dangerous and unproductive, and we must take in the interests of the minority and include them in the picture or we may never heal social/economic barriers. I also really like how Kant’s categorical imperative builds up empathy in us, and forces us to call ourselves out for being selfish and harmful. I think this could completely change the way we think in regards to the environment and could lead to tons of positive change. I’d definitely apply Kant’s categorical imperative to situations where utilitarianism is harmful, and in almost all situations, as long as the impact does not harm others. A personal issue I can apply my morality to is my veganism. Over winter break, I went vegan solely because I wanted to clear up my skin. I honestly didn’t really care about the entire environmental and animal rights aspect of veganism, I’d always brush it off because I saw both as trivial (which I’m aware was very ignorant of me.) After learning about the categorical imperative in class, I realized that I was only using veganism as a “means” to clear up my skin, not because I cared about all of terrible things the meat/dairy industry does to the environment and to animals. I was not a vegan out of empathy for animals, I had my secret evil vain motives. However, now that I can apply my newfound morality to the situation, I decided to look into the environmental benefits that come with veganism. I completely see the diet as an “end” in itself, and even though my skin has not cleared up one bit, I am continuing the diet because I believe it’s the ethically and morally correct thing to do. Now, I don’t know if you, the reader, have ever had the pleasure of seeing or hearing of a musical by the name of Urinetown (I applaud you if you have), but I think it brings up an interesting moral dilemma that begs to be discussed. So, the people of amenity #9 had good reason to take the UGC down, and as the show is coming to a close, things look like they’re going to be good for all in the town. This is soooooooo not the case. The hard truth is that they chose to live good and die fast, using up what little resources they had left in a short period of time, ending the show dead on the stage from dehydration and sickness. Their brief happiness ensured everyone’s death, and the viewer, despite their hate for the UGC, is forced to revaluate the positives of the company and the regime it formed. It is mentioned in a line during the closing number that the UGC was very effective in regulating water consumption, and was able to supply its employees with healthy salaries and good lives that would have lasted for quite a while if not for the revolutionaries. And even though there were people suffering, they were alive, weren’t they?